Staying fit is known to ward off certain lifestyle diseases, and weight training plays an important role—especially as we age. Here are conditions that weight training helps to prevent, helps to manage, or that aids in recovery and rehabilitation. For some of these conditions, an experienced exercise physiologist with strength training qualifications may be required, and treatment may best proceed in conjunction with a medical practitioner. From about the age of 35, muscle is progressively lost from the body unless an effort is made to counter the loss. Muscle is also lost during states of illness and disease. The loss of muscle is called sarcopenia. Resistance training can increase or maintain muscle, or slow the rate of muscle loss. Type 2 diabetes is a condition characterized by the failure to produce sufficient insulin in the body that results in high levels of blood glucose. This can cause a range of conditions, including heart disease, nerve damage to the feet, and even kidney disease. Resistance and strength training builds muscle that increases general fitness and provides additional storage for glucose. People with type 1 diabetes may also benefit from weight training. 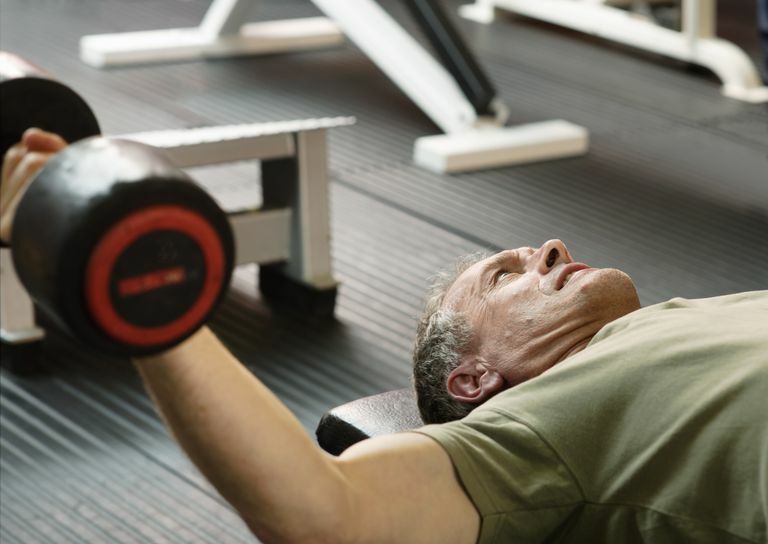 Weight training can reduce your risk of developing cardiac disease. Specifically, resistance training has been shown to reduce blood pressure, increase HDL cholesterol—that is, "good" cholesterol—and to reduce blood glucose and insulin levels. The same kinds of benefits can be seen in people who already have heart disease. For this reason, resistance training should be included as part of a complete cardiac rehabilitation program. Progressive resistance training is a safe and effective way to improve muscle strength after a stroke. Improvements in muscle strength influence walking and movement performance, as well as activity participation. Current recommendations for stroke rehabilitation include strength training, which can be an effective form of fitness training for subjects with minor weakness. For many people, bone loss and thinning can be arrested with appropriate exercise. Weight-bearing exercise of the type used in strength training (with free weights or machines) is an established form of a weight-bearing workout that can ward against osteoporosis. Parkinson's disease is a progressive disease of the nervous system marked by physical shakes, muscular rigidity, and slow, uncertain movement. It affects mainly middle-aged and elderly people. In at least one study, a progressive resistance training program improved walking initiation, speed, and power in a study group. Osteoarthritis is the loss of the cartilage (and bone) that protects the joints. Osteoarthritis occurs mostly from middle age and into old age. Osteoarthritis causes pain and stiffness, especially in the hip, knee, and thumb joints. Somewhat paradoxically, weight training can be useful in managing the disease. Osteoarthritis should be distinguished from rheumatoid arthritis, which is an autoimmune disease. Progressive resistance training also has established strength and functional benefits for sufferers of rheumatoid arthritis. Weight training has been utilized with some success during therapy and recovery from cancer to maintain muscle mass and overall weight, which may be lost as a result of chemotherapy and radiation treatments. Multiple sclerosis is a progressive disease of the nervous system. Symptoms may include numbness, impairment of speech and of muscle coordination, blurred vision, and fatigue. In recent years, progressive strength training has been recognized as an effective tool in the management of people with multiple sclerosis. Hordern MD, Dunstan DW, Prins JB, Baker MK, Singh MA, Coombes JS. Exercise prescription for patients with type 2 diabetes and pre-diabetes: a position statement. Exercise and Sport Science Australia. J Sci Med Sport 2012 Jan;15(1):25-31. Hurkmans E, van der Giesen FJ, Vliet Vlieland TP, Schoones J, Van den Ende EC. Dynamic exercise programs (aerobic capacity and/or muscle strength training) in patients with rheumatoid arthritis. Cochrane Database Syst Rev. 2009 Oct 7;(4):CD006853. Eur J Prev Cardiol. American College of Rheumatology 2012 recommendations for the use of nonpharmacologic and pharmacologic therapies in osteoarthritis of the hand, hip, and knee. Arthritis Care Res. 2012 Apr;64(4):465-74. 2012 Feb;19(1):81-94. Marzolini S, Oh PI, Brooks D. Hochberg MC, Altman RD, April KT, Benkhalti M, Guyatt G, McGowan J, Towheed T, Welch V, Wells G, Tugwell P. Effect of combined aerobic and resistance training versus aerobic training alone in individuals with coronary artery disease: a meta-analysis. Eur J Prev Cardiol. 2012 Feb;19(1):81-94. American College of Rheumatology. De Backer IC, Schep G, Backx FJ, Vreugdenhil G, Kuipers H. Minerva. Resistance training in cancer survivors: a systematic review. Int J Sports Med. 2009 Oct;30(10):703-12. Med. 2008 Aug;99(4):353-68. Review. Lexell J, Flansbjer UB. Muscle strength training, gait performance and physiotherapy after stroke. Minerva Med. 2008 Aug;99(4):353-68. Hass CJ, Buckley TA, Pitsikoulis C, Barthelemy EJ. Progressive resistance training improves gait initiation in individuals with Parkinson's disease. Gait Posture. 2012 Apr;35(4):669-73. Kjølhede T, Vissing K, Dalgas U. Multiple sclerosis and progressive resistance training: a systematic review. Mult Scler. 2012 Sep;18(9):1215-28. Gómez-Cabello A, Ara I, González-Agüero A, Casajús JA, Vicente-Rodríguez G. Effects of training on bone mass in older adults: a systematic review. Sports Med. 2012 Apr 1;42(4):301-25. doi: 10.2165/11597670.